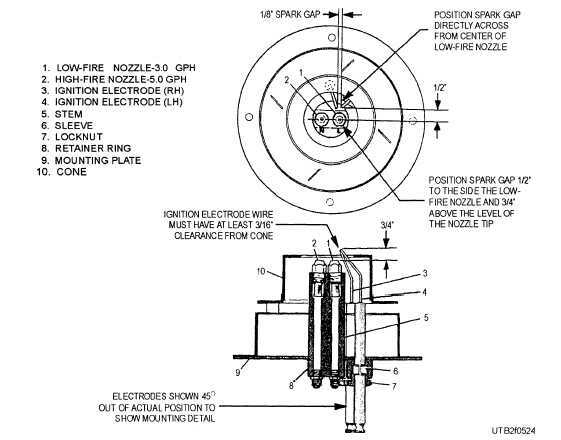 The automatic blowdown valve (fig. 5-26) is operated by oil pressure from the water pump. If the blowdown valve diaphragm gets ruptured, oil will likely appear in the waste discharge. Replace a ruptured valve diaphragm immediately to prevent the loss of oil from the pump crankcase. As preventive maintenance, replace the blowdown valve diaphragm whenever the water pump diaphragms are replaced. Since wear may affect the operation of the blowdown valve, dissemble the valve each time the diaphragm is replaced. A troubleshooting chart for the Clayton steam generator, Model RO-33-PL, is provided in table S of appendix II. This chart will guide you in finding and correcting troubles in that make and model of generator. You will find similar charts in the instruction manuals provided by the manufacturers of other makes of steam generators. Make sure you are familiar with the manufacturer's manual for the generator used at your activity, and follow the procedures prescribed for the maintenance and repair of the equipment. Figure 5-24. - Burner manifold. The automatic washer (fig. 5-27), described in this chapter, is typical of the machines on the market today. The circuits and timing diagrams are composites of the more common features found in several different models. For the equipment you are installing or working on, follow the manufacturer's instruction manual. The automatic clothes washing cycle can be broken down into four basic operations - fill, agitate, spin, and drain. Nearly all of these operations are repeated two or more times throughout a complete washing cycle and, for the most part, are controlled by a timing assembly.